As part of its 25th anniversary, the Foundation has given a £5 million endowment to the Roundhouse, to support the work of the Roundhouse Studios. The gift is made in recognition of the organisations’ long-standing relationship. The Studios – which work with young people aged 11-25 – will be renamed the ‘Paul Hamlyn Roundhouse Studios’. The announcement was made at a ceremony at the Roundhouse on Wednesday 3 October. 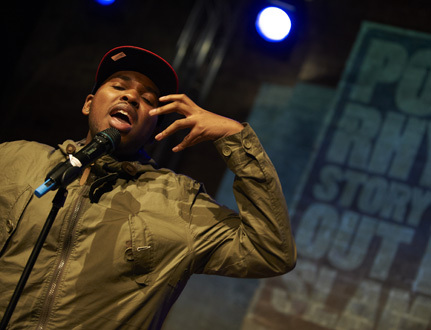 The event featured a showcase performance by young people that have developed their talents through the Roundhouse Studios’ programmes. These included the Roundhouse Choir, spoken word performers and Funk da Cirque, a group of dancers spanning the programme’s 11-25 age range. The Roundhouse Studios are a dedicated, state-of-the-art creative centre situated beneath the venue’s Main Space, one of the UK’s most well-known music and performance venues. It annually provides 3000 young people with opportunities to develop skills in music and music production, circus, theatre, poetry, TV and video, radio and digital media. The Studios host learning and development opportunities along with mentoring services for young people, and are home to an in-house online radio station run entirely by under-26s. The creative programme that takes place inside the Studios encompasses creative projects open to all 11-25 year-olds, plus projects with education partners and targeted community and outreach work specifically designed for those who are disabled, homeless, out of education or training, excluded or at risk. The endowment will enable the Roundhouse Studios to continue working with thousands of young people from diverse backgrounds, using creative opportunities to engage young people, offer them an expressive outlet and equip them with vital skills to improve their employment prospects. Speaking at the announcement, Jane Hamlyn, PHF chair, said: “My father set up the Foundation in 1987 and we are marking the 25th anniversary in a number of different ways. Tonight is the first major gift we are announcing in Britain – and there could not be a more appropriate one. The energy, the drive, the desire to learn, the determination of the thousands of young people who make the Roundhouse their place every year embodies what the Paul Hamlyn Foundation believes in. Marcus Davey, Chief Executive and Artistic Director of the Roundhouse, added: “Young people are at the heart of everything the Roundhouse does: we are passionate about helping them to achieve their creative potential, and to use it to build better futures, especially at a time when they face so many challenges.